Caddy and matching coffee mug. 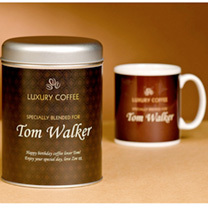 Caddy contains 227g coffee and is personalised with a name and a message on both sides. Mug is dishwasher and microwave safe. Personalisation: mug and tin 14 letters, message (tin) up to 80 letters.